The North Block consists of 7 mineral license applications covering 48 line kilometres of the Devonian – Permian / Cretaceous contact believed to be highly prospective for sedimentary copper deposits. Two of the license applications are contiguous to areas where historical exploration returned rock sample values ranging from 1.6 to 7.82 percent copper. Tasca cautions investors it has not yet verified any of the historical data. Clive Massey, chief executive officer, commented: "I am extremely bullish on the future price of copper. When Max Resource Corp.'s gold discovery in Choco unexpectedly made the Gachala project available I felt Tasca had to pounce on the opportunity." He added: "We are planning to implement an aggressive exploration programme for this year and are very fortunate to have Brett Matich, Max's President and CEO prepared to assist our technical team, as both the team and Mr. Matich are convinced a concentrated exploration effort in the underexplored Gachala region has the potential to define the world's next copper frontier." Mr. Matich commented, "I am looking forward to assisting Tasca's technical team in advancing the Gachala project, as we see the region as a highly prospective area for a massive copper discovery." Two of the seven mineral license applications comprising the 13,280 hectare North Block cover the western limb of the Anticlinal Montecristo in the area adjacent to and immediately north of the Sinai property where Rio Tinto Mining and Exploration Ltd. completed stream sediment and limited rock sampling in 1999. Rio Tinto took a total of 47 rock samples with 12 returning values in excess of 1 per cent copper, ranging from 1.6 per cent to 7.82 per cent (source: E.E. Vargas Ruiz, 1999; Exploracion Geoquimica Chivor Colombia Rio Tinto Mining and Exploration Ltd.). Tasca cautions investors that mineralization on the Sinai property is not necessarily indicative of similar mineralization on its licence applications. Another two of the license applications cover a 4 kilometre long cobalt anomaly identified by the Colombian Geological Survey. This metal is of extreme interest to the Company as cobalt is one of the key accessory metals for sedimentary copper deposits. The 7 North Block mineral license applications form part of the 53,538 hectare Gachala sedimentary copper project. The Gachala project lies within a northeast trending 250km-by-120km belt of Devonian-through-Cretaceous-age rocks in a geological setting conducive to hosting sedimentary copper deposits. Research by Rodriguez and Warden has found similarities between the sedimentary basin in Colombia and the sedimentary basin hosting the Zambian copper belt of Africa (source: C. Rodriguez and A.J. Warden (1993); "Overview of some Colombian gold deposits and their development potential"; Mineralium Deposita, Vol. 28, pages 47 to 57). In total, the 30 mineral license applications of the Gachala Project cover an aggregate 107 line kms of the highly prospective contact between the Devonian-Permian red beds and overlying Cretaceous reducing black shales, one of the settings typical of these copper deposits. 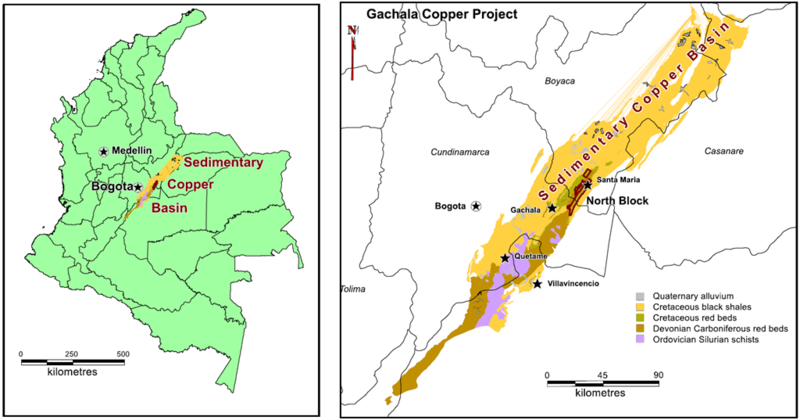 A detailed review of the Colombian Geological Survey reports documents a number of historical copper occurrences within or adjacent to a number of the Gachala mineral license applications. Most of these occurrences consist of locations marked on the map with no descriptions in the literature. The Tasca exploration team will immediately commence examination and evaluation of the occurrences in the North Block area to attempt to verify the historical data. Sporadic historic exploration throughout the central 5,625 sq km of the sedimentary belt has identified several zones and areas of copper mineralization, a number of which appear to lie on or proximal to the Gachala project mineral license applications. Readers are cautioned that a "qualified person" (as defined by National Instrument 43-101) has not yet completed sufficient work to be able to verify the historical information contained in this press release. Management also cautions that past results or discoveries on adjacent properties may not necessarily be indicative to the presence of mineralization on the Company's properties. The Company intends to consolidate its issued and outstanding common shares on a two (2) pre-consolidation shares for one (1) post consolidation share. As the Company currently has 51,944,542 common shares outstanding, it expects that it will have approximately 25,972,271 common shares outstanding after the consolidation. The Company intends to complete the consolidation within the next two weeks and does not intend to change its name in connection with the consolidation. Tasca has entered into a non binding letter of intent with MAX Resource Corp. whereby it proposes to acquire from MAX 100% of 7 mineral license applications known as the North Block of the Gachala project located in Colombia, South America. Under the terms of the letter of intent, Tasca has agreed to issue a total of 6,000,000 post consolidation common shares to MAX in consideration of the acquisition of a 100% interest in the 7 North Block claims. The letter of intent is subject to customary closing conditions, including due diligence of the parties, completion of the Tasca consolidation, execution of a definitive agreement, receipt of all third party consents and regulatory approvals including the approval of the TSX Venture Exchange approval and other customary closing conditions for a transaction of this nature. The transaction is at arms-length and there is no assurance the transaction will be completed as planned or at all. R. Tim Henneberry, P.Geo. (BC) and Tasca's geologist, is the Qualified Person who has reviewed and approved the technical content of this news release. Except for the historical information presented herein, matters discussed in this news release contain forward-looking statements that are subject to certain risks and uncertainties that could cause actual results to differ materially from any future results, performance or achievements expressed or implied by such statements. Statements that are not historical facts, including statements that are preceded by, followed by, or that include such words as "estimate," "anticipate," "believe," "plan" or "expect" or similar statements are forward-looking statements. This forward-looking information includes, or may be based upon estimates, forecasts and statements of management's expectations with respect to, among other things, the completion of the proposed transaction with Max, the issuance of permits, the size and quality of mineral resources, future trends for the company, progress in development of mineral properties, future production and sales volumes, capital costs, mine production costs, demand and market outlook for metals, future metal prices and treatment and refining or milling charges, the outcome of legal proceedings, the timing of exploration, development and mining activities, acquisition of shares in other companies and the financial results of the company. Other risks include risks associated with seeking the capital necessary to complete the proposed transaction, the regulatory approval process, competitive companies, future capital requirements and the Company's ability and level of support for its exploration and development activities. There can be no assurance that the Company will be able to complete the proposed transaction, that the Company's exploration efforts will succeed or the Company will ultimately achieve commercial success. These forward-looking statements are made as of the date of this news release, and the Company assumes no obligation to update the forward-looking statements, or to update the reasons why actual results could differ from those projected in the forward-looking statements. Although the Company believes that the beliefs, plans, expectations and intentions contained in this news release are reasonable, there can be no assurance those beliefs, plans, expectations or intentions will prove to be accurate. Investors should consider all of the information set forth herein and should also refer to the risk factors disclosed in the Company's periodic reports filed from time-to-time.